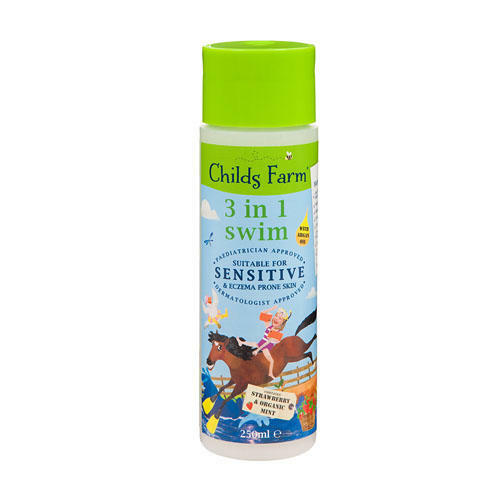 Hi [INSERT YOUR FRIEND'S NAME HERE], Please check this out https://www.proactivehealthcare.co.uk/childs-farm-strawberry-mint-3-in-1-swim?referrer=0 and get £4 off your first order (minimum order £30 excl. shipping). Thanks! Ingredients: Aqua, Sodium Coco-Sulfate, Cocamidopropyl Betaine, Glycerin, Sodium Chloride, Benzyl Alcohol, Lauryl Glucoside, Sodium Lauryl Glucose Carboxylate, Parfum, Guar Hydroxypropyltrimonium Chloride, Stearyl Citrate, Argan Oil Polyglyceryl-6 Esters, Starch Hydroxypropyltrimonium Chloride, Sucrose Laurate, Lactic Acid, Dehydroacetic Acid, Mentha Arvensis (Peppermint) Oil*, Citric Acid, Alcohol, Urea, Sodium Lactate, Benzoic Acid, Sodium Benzoate. Massage a large dollop all over wet hair and body then rise. Repeat on hair that is long or prone to tangles. If product gets in eyes, rinse well with water. External use only. If irritation occurs wash with copious amounts of water. If irritation continues, stop use.